Hepatica Digestive Enzymes + Probiotic is a supplement containing a combination of the most important digestive enzymes, such as amylase, protease, lipase, lactase and cellulase. Moreover, the product is enhanced with probiotic bacteria strain Bacillus coagulans GBI-30 6086. The product provides support for the process of food digestion and the proper functioning of the lower digestive tract. Development, growth and mechanisms of the basic vital functions are determined by nutrition, that is, the provision of all necessary nutrients to the body system. It is often the case that it is impossible to immediately use the food provided from the outside because of its form and it must undergo mechanical and chemical treatment. Digestion is a very complex process, in which the multi-particulate compounds are subjected to enzymatic hydrolysis and broken down into simple compounds, in order to be absorbed by the body system in the digestive tract. 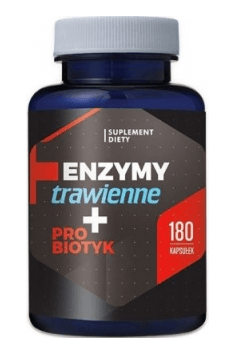 For this purpose, the body system needs digestive enzymes which, with the participation of water molecules, catalyze the decomposition of complex nutrients into basic organic compounds, such as amino acids, simple sugars, fatty acids and glycerol. The major digestive enzymes are amylase, lipase, protease, lactase and cellulase. Amylases are responsible for the breakdown of glycosidic bonds in molecules of carbohydrates; lipase breaks down ester bonds of fats; proteases catalyze the hydrolysis of peptide bonds of proteins; lactase is responsible for the breakdown of lactose (milk sugar) into monosaccharides (galactose and glucose); cellulase helps to release glucose from cellulose contained in the dietary fibre. Large amounts of dietary fibre, provided with diets rich in vegetables and fruits, reduce the absorption and digestion of other nutrients (vitamins, minerals, proteins, fats and carbohydrates). The human body system does not produce enzymes breaking down the cellulose bonds that occur in the dietary fibres. Cellulase allows for the digestion of fibre and the increase in digestibility and absorption of the above mentioned components, which contributes to a better nutrition of the whole organism. Lactase deficiencies cause clinical symptoms, in the form of aqueous diarrhea, abdominal pain, gas and bloating. People suffering from this disorder must avoid consuming lactose, which is contained in dairy products. There are inborn and secondary deficiencies of this enzyme. The secondary deficiency is mostly caused by the diseases damaging peaks of the intestinal villi (rotavirus and bacterial infections, parasites, antibiotics, NSAIDs, malnutrition, mucoviscidosis and Crohn's disease). The inborn deficiency is caused by the declining with age lactase activity. In both cases, the supply of lactase in the form of enzymes allows for the consumption of dairy products without the fear of negative gastrointestinal ailments. Enzyme deficiencies often result from damage to the organ or cells responsible for the production of these enzymes. People most vulnerable to the disorders of synthesis or secretion of digestive enzymes are those who suffer from coeliac disease, inflammatory bowel disease, pancreas, liver and bile ducts inflammations (acute and chronic). Equally often, the enzyme deficiency is caused by the decrease in secretory activity which results from ageing of the body system. In both cases, insufficient amount of digestive enzymes causes the disorder in the functioning of the digestive system, which can result in qualitative and quantitative deficiencies and unpleasant ailments (abdominal pain, bloating, gas, cramps or diarrhea). Studies demonstrated that the best solution to these problems is to supplement digestive enzymes in the form of a dietary supplement. Probiotic bacteria strain Bacillus coagulans GBI-30 6086 shows well documented properties. The beneficial properties of this culture of positive for the human body system intestinal micro-organisms can include: supports in a variety of digestive problems, e.g. irritable bowel syndrome, reduction of symptoms of rheumatoid arthritis and improvement in immune response during viral infections. Moreover, GBI-30 6086 is one of the most effective probiotics preventing post-antibiotic diarrhoea. To sum it all up, Hepatica Digestive Enzymes + Probiotic is a dietary supplement designed for all people who suffer from digestive enzymes deficiencies and struggling with often recurring gastrointestinal ailments. The product is a perfect support for people with lactase deficiencies, an enzyme digesting milk sugar, and people using high-calorie diets and consuming large amounts of dietary fibre. An addition of high-quality probiotic bacteria promotes the functioning of the immune system. Digestive Enzymes + Probiotic 180 caps. The recommendations of the producer concern people eating customarily 3 meals a day. People who eat more meals should take 1 capsule with each of them, especially if these are foods containing lactose or high level of dietary fiber.